ATOS Professional | Mentel Co.,Ltd. software and the ATOS 3D digitizer are designed to work seamlessly and 3D data is available directly after fringe projection. Single scans are automatically combined using a process-safe workflow based on a combination of reference points and surface matching. ATOS Professional is a knowledge base – it guides the operator through the complete scanning procedure and provides support for setting up new measuring tasks using guided project creation. Successful and cost-effective post-processing is based on the quality of 3D mesh data. ATOS Professional provides the unique algorithms for highest 3D mesh data quality combining small data size with accentuated fine details. ATOS Professional contains all the features of GOM Inspect Professional making ATOS Professional the complete, process-safe, parametric, traceable measuring and evaluation software for dimensional analysis of ATOS 3D data. The ATOS Professional software is used to run the sensor head, to process the 3D point cloud and to edit and post-process the data. The simple graphical user interface helps support today’s demanding tasks in quality control, manufacturing processes and reverse engineering. ATOS Professional features include: Sensor control, polygon mesh generation and editing, sectioning, feature and character line detection and primitive generation. For quality control and result analysis, tools such as CAD data import, import of measuring plans, registration, full-field deviation plots, section-based analysis, deviation of individual points, calipers, angles and diameters and report creation are available. The GOM software allows the determination of the Golden Mesh by either finding the best mesh or calculating an average mesh. When determined, the Golden Mesh can be exported as STL for reverse engineering to CAD or used as a reference for future part inspection. A timeline integrated in the graphical interface supports the management of multi-stage projects, for example in statistical process control (SPC) and deformation analysis. The software user can switch back and forth between stages within a trend project or display relevant/defined stage areas exclusively. The local coordinate system in the software makes it possible to perform local or drawing-based evaluations. Hence, the dimensioning within a coordinate system is possible, standardized GD&T position analysis can be combined easily with local coordinate analysis in the same reference system and complex alignment strategies can be implemented. The local coordinate systems also form the basis for 6DoF analysis. ATOS is a self-monitoring measuring system that verifies calibration status, transformation accuracy, environmental changes and part movement. This makes ATOS an industrial measuring solution that is ideal for operation in industrial production environments. With the latest Motion Replay functionality the movements from all axes of the motorization kit can now be recorded for the very first time – without the need for programming. Thus, when users need to measure identical or similar multiple parts, these measurement positions are simply played back. ATOS Professional contains Fast Inspection, the real-time evaluation of 3D surface deviation and inspection elements directly after each scan. Inspection information is continuously derived and displayed from the complete pre-imported or manually created measuring plan and CAD during measurement. Due to ATOS dynamic referencing, the object or the sensor can be easily and freely moved or positioned. Sensor and object do not need to be fixed in relation to each other, which allows flexible measurement planning. Navigation with the ATOS Digitizer is easy and fast as the sensor and measuring area are visualized online. The live module allows ATOS 3D scanners to also be employed for live object tracking, online part positioning, touch-probe measurement, in addition to full-field scanning. This tracking is based on the stereo camera principle in connection with the GOM reference point system. Single points as well as complete component geometries can be traced in space. The alignment or positional deviation of a component from the nominal position can be measured and tracked live by ATOS. 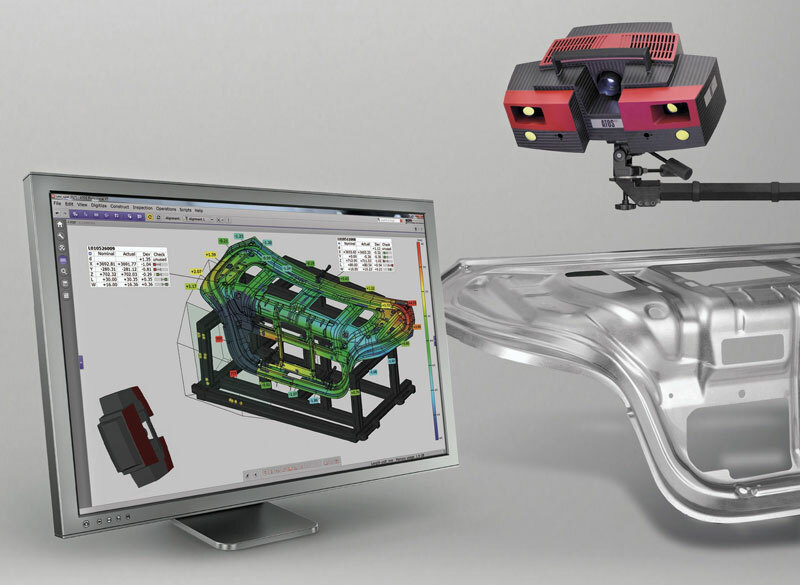 The Virtual Measuring Room has become an indispensable tool for automated 3D digitalization. Based on the ATOS Professional software, GOM offers an additional VMR software module. With VMR, the user only has one single button for complex measuring cell programming. Kiosk Interface is the next step towards automated process control. It is a human machine interface for simplified interaction with ATOS inspection cells. The Kiosk Interface automatically handles the complete measurement and inspection workflow. As human interaction is reduced, high precision and data quality are guaranteed.